A person who is currently living in the U.S. and is a beneficiary of an approved immigrant petition by a U.S. citizen or permanent resident or an employer has to file Form I-485 to adjust status to that of a permanent resident. 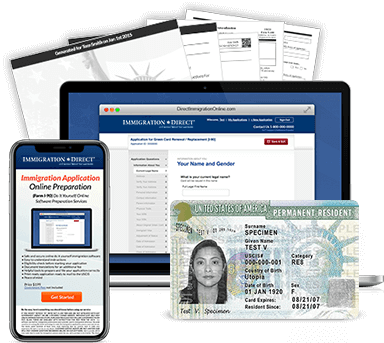 This application has to be filed with United States Citizenship and Immigration Services (USCIS) to get a green card. Applicants living in the U.S. and for whom the "Priority Date" is current, that is -a visa number is currently available, have to file Form I-485, Application to Adjust Status to Permanent Resident. Learn more about Priority Dates here. Applicants who are being sponsored by U.S. citizen spouse, parent or child may be eligible to file the immigrant petition and the adjustment of status application concurrently. Click here to start the process of completing and filing Forms I-130 and I-485 concurrently. Applicants living abroad are not eligible to file Form I-485, Application for Adjustment of Status to Permanent Resident. Applicants living abroad who have an approved immigrant petition need to file for an Immigrant Visa with a U.S. consulate abroad. Complete an error-free I-485 application today using our simple, easy-to-use system.